Drive, ride or share? It's a question more people are asking themselves as transportation options are rapidly evolving. But what does it mean for road congestion and the environment? 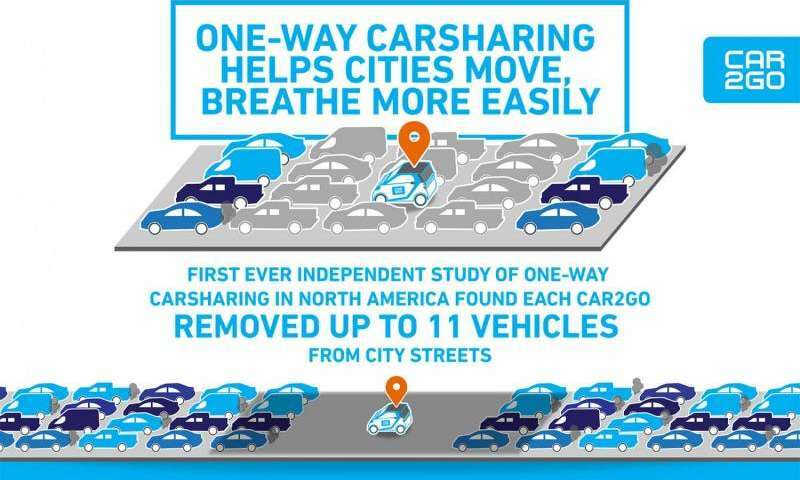 In the first-ever North American one-way carsharing impact study, the Transportation Sustainability Research Center (TSRC) reveals that car2go has a substantive impact on improving urban mobility and reducing greenhouse gas emissions. The three-year study, led by TSRC Co-Director Susan Shaheen and Research Engineer Elliot Martin, is the first-ever analysis looking specifically at one-way carsharing in North America and its impact on mobility. TSRC teamed up with car2go in five cities, Calgary, Alberta; San Diego, California; Seattle, Washington; Vancouver, British Columbia; and Washington, D.C., to gather data, clearly showing one-way carsharing reduces the number of cars traveling on city roads and occupying parking spaces on city street. "Our exhaustive, three-year research effort into one-way carsharing reveals that car2go vehicles result in fewer privately-owned vehicles on the road, fewer vehicle miles traveled and a reduction in greenhouse gas emissions," said Susan Shaheen, Co-Director of TSRC. "Participation from car2go and its members, the largest free-floating one-way carsharing service in North America, gave us unprecedented access and insight into how this kind of innovative mobility service is impacting North American cities." Carsharing, the shared use of a vehicle fleet by members for tripmaking on a per trip basis, has been gaining traction around the world, but researchers wanted to know more about the impacts it was having. For the study, Shaheen and Martin looked specifically at one-way carsharing, which enables members, who pay by the minute, to begin and end a trip at different locations—either throughout a free floating zone or station based model with designated parking locations. Shaheen says car2go, currently the largest carsharing operator in the world, with a presence in nine countries and nearly 30 cities, made a great partner for the breadth of data the team could use. It operates as a one-way instant access carsharing system within a pre-defined urban zone. Members can find an unoccupied parked vehicle, access it immediately, and use it to meet their local travel needs. Estimates suggest that car2go's one-way carsharing service prevented between 10 to 29 million VMT per year per city, depending on assumptions of suppressed mileage, which in-turn removed between 5.5 to 12.7 metric tons of GHG emissions per car2go vehicle annually (on average). "Car2go's mission is to improve the quality of people's lives by delivering instant and affordable mobility on their own terms," said Paul DeLong, president and CEO of car2go North America. "TSRC's findings make it clear that one-way carsharing has a significant and beneficial impact in reducing private vehicle miles traveled and emissions in cities, ultimately helping more people get where they want to go more efficiently while helping to reduce traffic and parking congestion." The study also revealed notable 2015 city-specific findings across the five cities analyzed. Calgary: Each car2go vehicle removed an estimated 11 vehicles from Calgary's roads: more than 6,000 vehicles total. In 2015, car2go in Calgary reduced overall VMT by up to an estimated 32.9 million miles. Each car2go Calgary vehicle eliminated up to 14 metric tons of GHG emissions. Car2go Calgary also prevented up to an estimated 8,000 metric tons of GHG emissions from polluting Calgary's air. San Diego: Each car2go vehicle removed an estimated seven vehicles from San Diego roads: nearly 3,000 vehicles total. In 2015, car2go in San Diego reduced overall VMT by up to an estimated 20 million miles. Each car2go San Diego vehicle eliminated up to 13 metric tons of GHG emissions. Car2go San Diego also prevented up to an estimated 5,300 metric tons of GHG emissions from polluting San Diego's air. Seattle: Each car2go vehicle removed an estimated 10 vehicles from Seattle's roads: more than 6,300 vehicles total. In 2015, car2go in Seattle reduced overall VMT by up to an estimated 34.2 million miles. Each car2go Seattle vehicle eliminated up to 14 metric tons of GHG emissions. Car2go Seattle also prevented up to an estimated 9,000 metric tons of GHG emissions from polluting Seattle's air. Vancouver: Each car2go vehicle removed an estimated nine vehicles from Vancouver's roads: more than 8,200 vehicles total. In 2015, car2go in Vancouver reduced overall VMT by up to an estimated 37.5 million miles. Each car2go Vancouver vehicle eliminated up to 11 metric tons of GHG emissions. Car2go Vancouver also prevented up to an estimated 10,000 metric tons of GHG emissions from polluting Vancouver air. Washington, D.C.: Each car2go vehicle removed an estimated seven vehicles from Washington, D.C.'s roads: more than 4,600 vehicles total. In 2015, car2go in Washington, D.C. reduced overall VMT by up to an estimated 21.3 million miles. Each car2go Washington, D.C. vehicle eliminated up to 10 metric tons of GHG emissions. Car2go Washington, D.C. also prevented up to an estimated 6,500 metric tons of GHG emissions from polluting Washington, D.C.'s air. The average age of vehicles car2go members reported selling averaged 14.4 years across all the cities, thus helping to remove more polluting vehicles with older emission systems from city streets.